Three years before his death, Michel Foucault delivered a series of lectures at the Catholic University of Louvain that until recently remained almost unknown. These lectures—which focus on the role of avowal, or confession, in the determination of truth and justice—provide the missing link between Foucault’s early work on madness, delinquency, and sexuality and his later explorations of subjectivity in Greek and Roman antiquity. Published here for the first time, the 1981 lectures have been superbly translated by Stephen W. Sawyer and expertly edited and extensively annotated by Fabienne Brion and Bernard E. Harcourt. They are accompanied by two contemporaneous interviews with Foucault in which he elaborates on a number of the key themes. 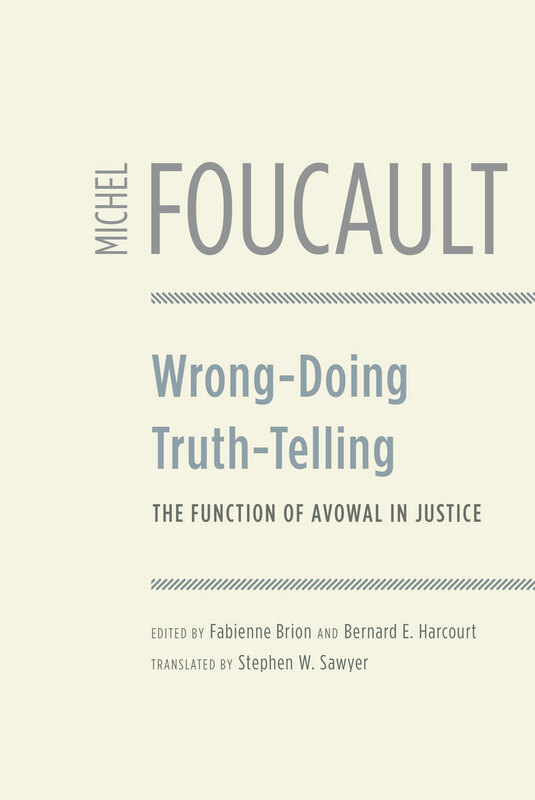 An essential companion to Discipline and Punish, Wrong-Doing, Truth-Telling will take its place as one of the most significant works of Foucault to appear in decades, and will be necessary reading for all those interested in his thought. Dr. Leuret, avowal, and the therapeutic operation. — The supposed effects of truth-telling on oneself and of knowledge of the self. — Characteristics of avowal. — The spread of avowal within Western Christian societies: individuals bound to their truth and obligated in their relationships to others through the truth told. — A historical-political problem: how the individual binds himself to his truth and to the power that exerts itself upon him. — A historical-philosophical problem: how individuals are bound by forms of veridiction. — A counterpoint to positivism: a critical philosophy of veridictions. — The problem of “who is being judged” in penal institutions. — Penal practices and technologies of government. — Governing through truth. A political and institutional ethnology of truthful speech. — Truth-telling and speaking justice. — Scope of the study. — Veridiction and jurisdiction in Homer’s Iliad. — The competition between Menelaus and Antilochus. — The object of Antilochus’s avowal. —Justice and agon; agon and truth. —The chariot race and the challenge of the oath, two liturgies of truth, two games designed to represent justly the truth of their respective strengths. — A ritual of commemoration. — Veridiction and jurisdiction in Hesiod’s Works and Days. — Dikazein and krinein. — The oath of the accusers and the co-jurors in dikazein: a game of two parties, the criteria being the social status of the adversaries. — The oath of the judge in krinein: a game of three parties, the criteria being dikaion. — The social weight of adversaries and “the reality of things”: dikaion and alethes. The representation of law in Sophocles’s Oedipus Rex. — A judicial paradigm. — Essential elements of the tragedy. — Two recognitions, three alethurgies. — Veridiction and prophecy. — Veridiction and tyranny. — Veridiction and witnessing avowal. — Grandeur of the parties, freedom to speak, and the effect of truth in the inquiry. — Recognition by the chorus, conditions for recognition by Oedipus. — From truth-telling to saying “I.” — A procedure that conforms to nomos, a veridiction that repeats the word of the prophet and completes that of the man of techne technes. Hermeneutics of the text and hermeneutics of the self in early Christianity. — Veridiction of the self in pagan antiquity. — The Pythagorean examination of conscience: purification of self and mnemotechnics. — The Stoic examination of conscience: the government of the self and the remembering of codes. — The Stoic expositio animae: medicine of passions and degrees of liberty. — Penance in early Christianity. — The problem of reintegration. — Penance as a status that manifests a particular state. — The meanings of exomologesis. — A life in the form of avowal, an avowal in the form of life. — A ritual of supplication. — Beyond the medical or judicial, the model of the martyr. — Veridiction of the self and mortification of the self. — From the public manifestation of the self as sinner to the verbalization of the self: temptation and illusion. Practice of veridiction in monastic institutions of the fourth and fifth centuries: the Apophthegmata patrum and the writings of Cassian. — Monasticism: between the life of penance and philosophical existence. — Characteristics of the direction of conscience in ancient culture. — Characteristics of the direction of conscience in monasticism: an obedience that is continuous, formal, and self-referential; humility, patience, and submission; the inversion of the relationship to verbalization. — Characteristics of the examination of conscience in monasticism: from action to thought. — Mobility of thought and illusion. — Discrimen and discretio: avowal and the origin of thought. — Veridiction of the self, hermeneutics of thought, and the rights-bearing subject. Characteristics of exagoreusis in the fourth and fifth centuries. — Renunciation of the self. — Truth of the text and truth of the self. — The separation and adjustment of the hermeneutics of the text and the hermeneutics of the self in Protestantism. — Illusion, evidence, and meaning (Descartes and Locke). — Illusion of the self about the self and the unconscious (Schopenhauer and Freud). — Juridification of avowal in the ecclesiastical tradition from the fourth to the seventh centuries. — Co-penetration of exagoreusis and exomologesis in the first monastic and lay communities. — Characteristics and origins of fixed penance: the monastic model and the model of Germanic law. — Sacramentalization and institutionalization of obligatory confession in the thirteenth century. — Juridification of the relationship between man and God. — Forms and meanings of avowal in the confessio oris. Juridification in ecclesiastical and political institutions. — From God as judge to a state of justice: sovereignty and truth. — Avowal, torture, and inquisitorial tests of truth. — Avowal, torture, and legal proofs. — Avowal, sovereign law, sovereign conscience, and punitive engagement. — Auto-veridiction, evidence, and penal dramaturgy. — Hetero-veridiction, examination, and legal psychiatry. — Relating the act to its author: the question of criminal subjectivity in the nineteenth century. — Monomania and the constitution of crime as psychiatric object. — Degeneration and the creation of the criminal as object for social defense. — From responsibility to dangerousness, from the rights-bearing subject to the criminal individual. — The question of criminal subjectivity in the twentieth century. — Hermeneutics of the subject and the meaning of crime for the criminal. — Accident, probability, and indices of criminal risk. — Veridiction of the subject and the breach in the contemporary penal system. "Fabienne Brion and Bernard Harcourt are to be congratulated for their invaluable work."